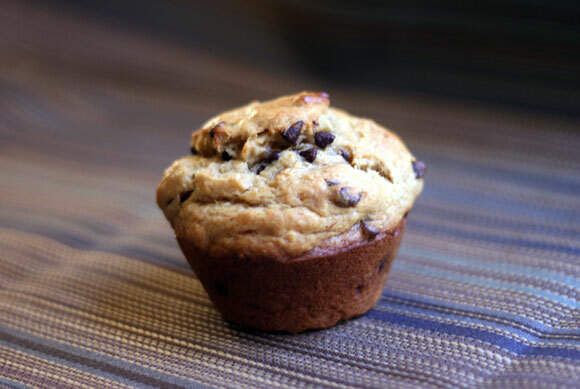 These muffins are great for breakfast, snack, or dessert. They are a delicious combination of banana bread, peanut butter, and chocolate. Do you prefer a loaf of banana bread or muffins? I think both are awesome, but muffins are definitely more fun. Preheat oven to 400°F. Lightly grease a 12-cup muffin tin or line with paper liners. Combine bananas, brown sugar, honey, peanut butter, eggs, oil, and vanilla together in the bowl of an electric mixer. Mix until smooth. Add flour, baking soda and salt, mixing until combined. Stir in chocolate chips. Bake until golden brown and a toothpick inserted in the muffins comes out clean, about 18-20 minutes.